Boori Monty Pryor was the Australian Children’s Laureate from 2012-13. 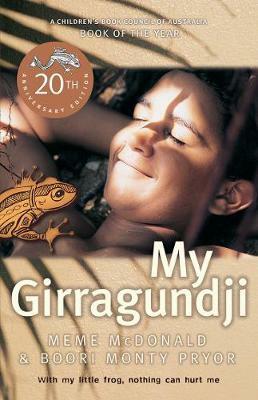 My Girragundji tells the story of an Indigenous boy growing up between two worlds, a boy who deals with bullies at school and a bad spirit that roams his family’s house at night. But with his Girragundji, a beautiful green tree frog, he feels he has the courage and the protection of his ancestors to face his biggest fears. Full of humour, My Girragundji will appeal to children afraid of the dark, and footy and nature lovers alike. With the combined talents of author Meme McDonald and Aboriginal storyteller Boori Monty Pryor, My Girragundji uses photography alongside words, and paints a picture of a lively and exciting family, and of nature in Queensland, so vivid it will stay with you long after the end of the book. A timeless story that confronts issues of family, school and diversity, the book is based on stories from Monty Pryor’s childhood and is celebrating its 20th anniversary in print this year! Julia Gorman works as a bookseller at Readings Carlton and Readings Kids.